Creative letter makers: Abhi, Adam Taylor, Agostina Dorin, Akin Cankorur, Alex Morgan, Aly Bartley, Amy Safaris, Andrew Herons, Anna-Lena Nikolovski, Antonios Antoniou, Aseem Rishi, Ashleigh Berryman, Auriolh, Carlotte Riley, Carly J Pater, Carolina Brites, Catherine Gruntman, Cathy Yexley, Cecilia McCormick, Christos Zenophontos, Contanza Milano, Corinne O’Donnell, Davey Blackett, Delphine de Marsangy, Dominika Baszko, Durden, Eddie Magee, Eileen Velthuis, Esi Essel, francesca Smyth, Freya Harrison, Gabby Walker, Georgia Cottington, Georgia Herman, Hanna Elise Jozefiak, Holly Davies, Holy Monger, Isla Wren Ava Steele, Jasmin Derflinger, Jenn Kemp, Jessica Jacob, Jessica Squires, Joe Carpentor, Julie Hackney, Katarina Hjorth, Kate Geary, Kate Strivens, Kirstie Maclean, Lewis Loughman, Lisa Rahman, Lizzie Heath, Lubna Ul Hasan, Luke Evans, Mandy Kemp, Marchionni Laura, Maria Paraskeuopoulau, Maria Reguera, Matt Bonner, Melissa Wooding, Mick Stevens, Micole de Haviland, Mikala McCormick, Naomi Thompson, Olga Funk, Polina Razlivanova, Polly Chan, Rachel McTsaac, Ramon Sherwood-Ellis, Rex, Roman, Ryan McGreavey, Sam Smith, Sam Watola, Sandra Pang, Sarah Lomas, Sarah Sandyford, Sarah Snaith, Senith David, Sophie Dolan, Sophie Freeman, Sophie Hilditch, Susan Corbett, T J Bull, Tamsin Thomas, Tanachapon Wianmana, Virginia Hodge, Zachariah Hoyd. To the creative letter makers: all the letters are being photographed in good lighting and you’ll be emailed a link when these are ready for you. Sarah. Participants left their computers behind and came along to get their hands dirty making decorative display letters. Ornate display type from the Victorian era often featured images of everyday life such as flowers or farm animals. This type style has been given a modern twist by graffiti artist Eine and on Pulp’s ‘We Love Life’ album cover. This style was brought up to date and personalised with modern motifs and materials. 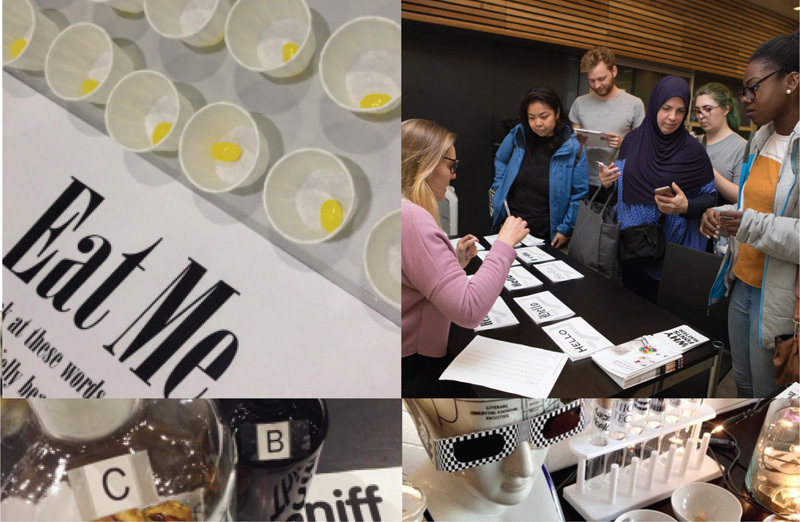 We had a thoroughly enjoyable creative day and all the participants had their work exhibited at Somerset House for the day. S Y: Type samples from Louis John Pouchée held in the St Bride Library collection. M E: Graffiti artist Eine’s Shoreditch shutters. 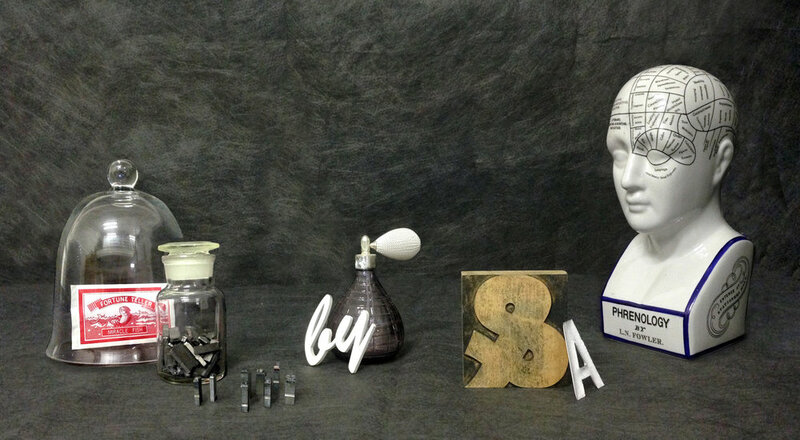 A P T Q: modern display letters made for Pick Me Up. 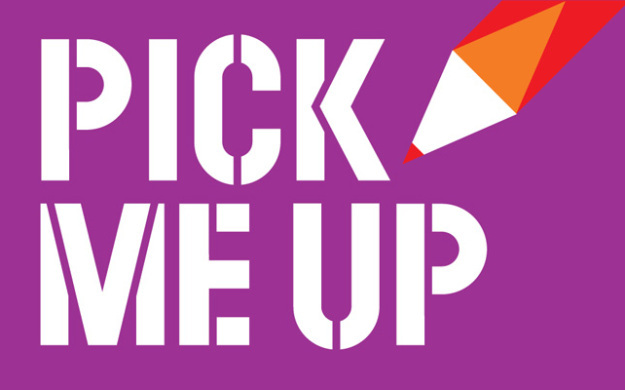 Pick Me Up is the UK’s original contemporary graphic arts festival. It returns in April for an 11-day celebration of graphic art, design and illustration. In addition to showcasing and selling original artworks and limited-edition prints from the industry’s elite and emerging talent. Each day the festival will be running an exciting and eclectic mix of lively evening events, creative forums and quirky family workshops including a letterpress workshop with Alan Kitching and creating decorative letters with Type Tasting.